Blennerville: gateway to Tralee's past, Liam Kelly and others, 1989, [NLI] Ir 94146 k 8, [TCD] PX-55-355. A Guide to Blennerville and the Dingle Peninsula, Frank Blennerhassett and Sara Hollwey, Dublin, c.1992. In the shadow of Sliabh Mish, The Heritage Council, Tralee, 2001. 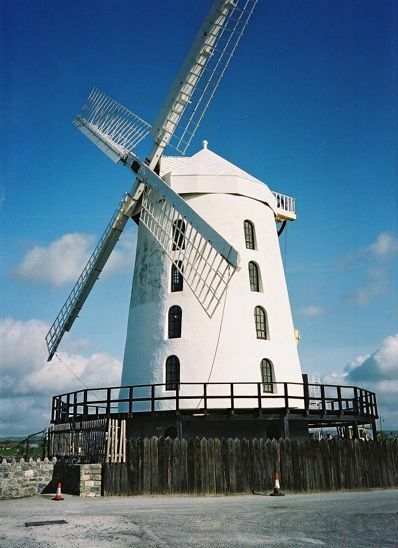 IEI leaflet 3063, on Blennerville Windmill. 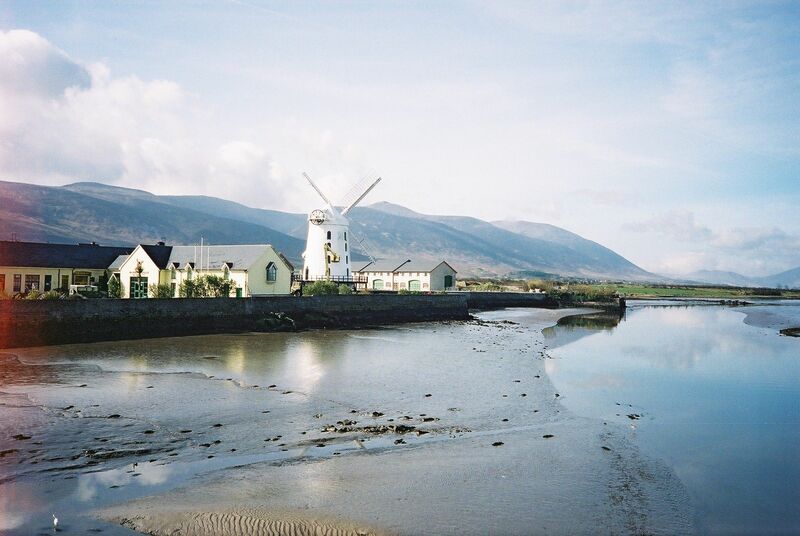 Blennerville was originally called Cathair Uí Mhóráin. It was settled by Sir Rowland Blennerhassett, 1st Baronet by 1783. He re-named it "Blennerville" after his family. 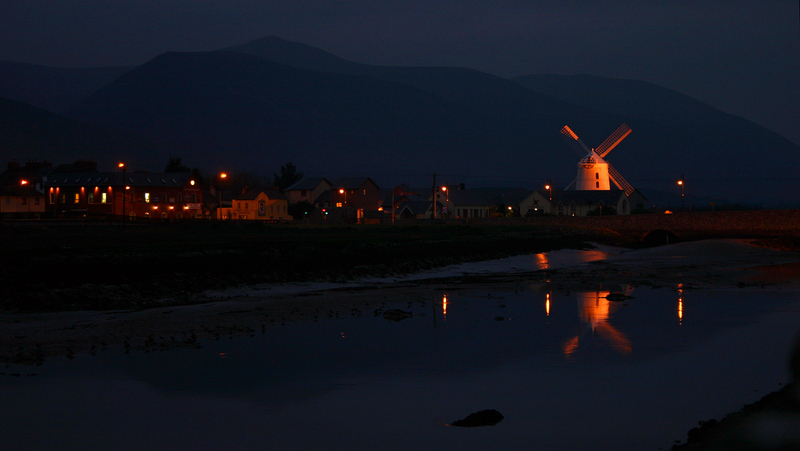 Blennerville was the old port for Tralee (before the Tralee Ship Canal built). 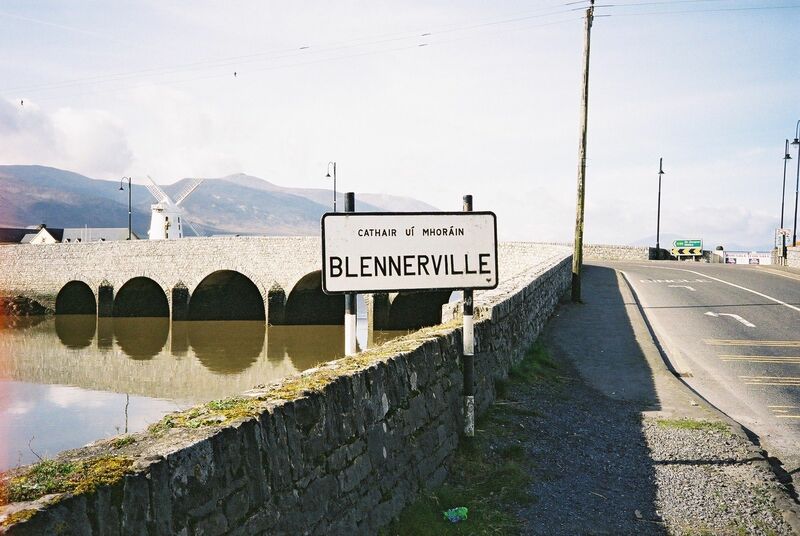 In early 19th century Blennerville was the centre of the Munster grain trade. Fine Georgian houses built on Main St, including Blennerville House and King's House. The silting of the river channel at Blennerville. The opening of the Tralee Ship Canal 1846. 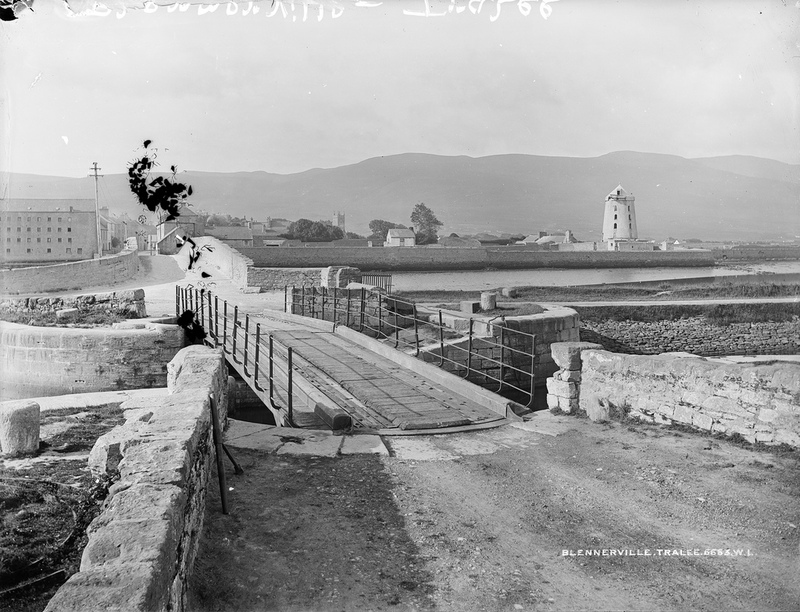 The building of Fenit Pier 1880, Fenit, N side of Tralee Bay. Blennerville Windmill fell into ruins. 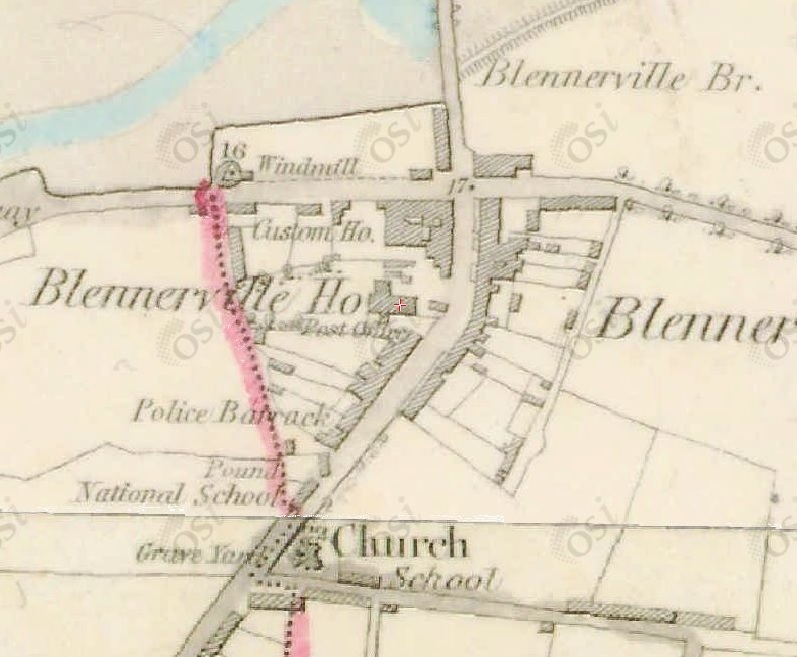 Blennerville on 1829 to 1842 map. 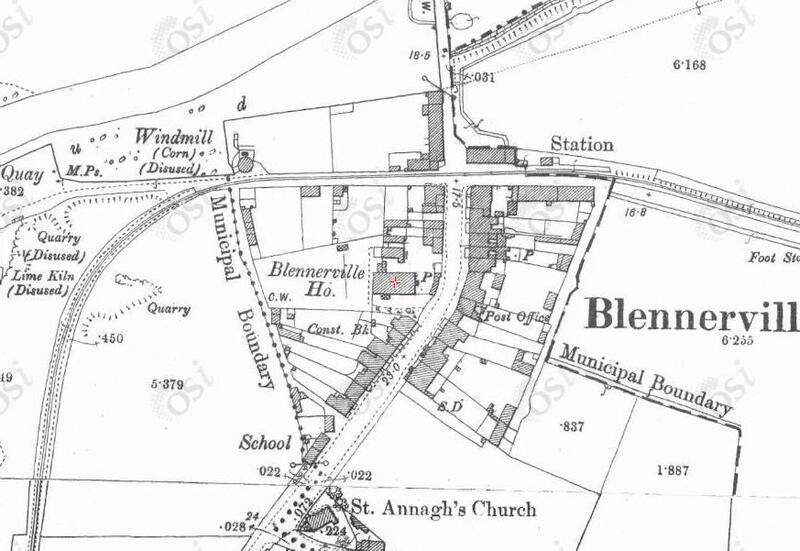 Blennerville on 1887 to 1913 map. See full size. From NLI. Blennerville Windmill. Visitors' centre on left. 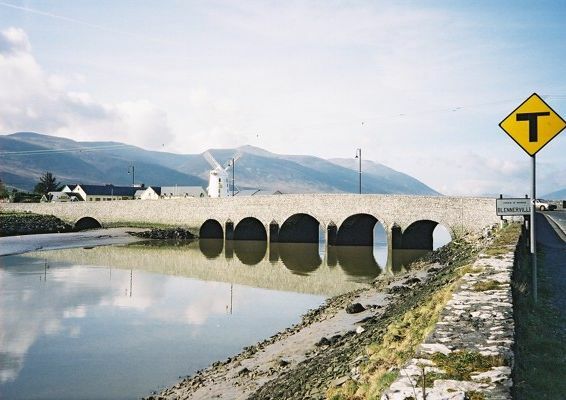 Blennerville Bridge was built 1751 by Col. John Blennerhassett. 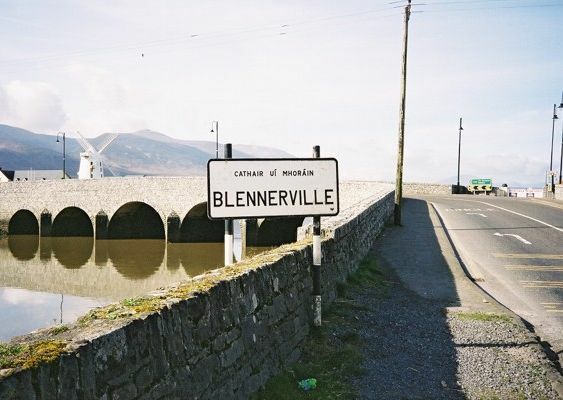 Think the place was not yet called Blennerville. The bridge takes most of the traffic to and from the Dingle Peninsula. It was strengthened and enlarged 1996. 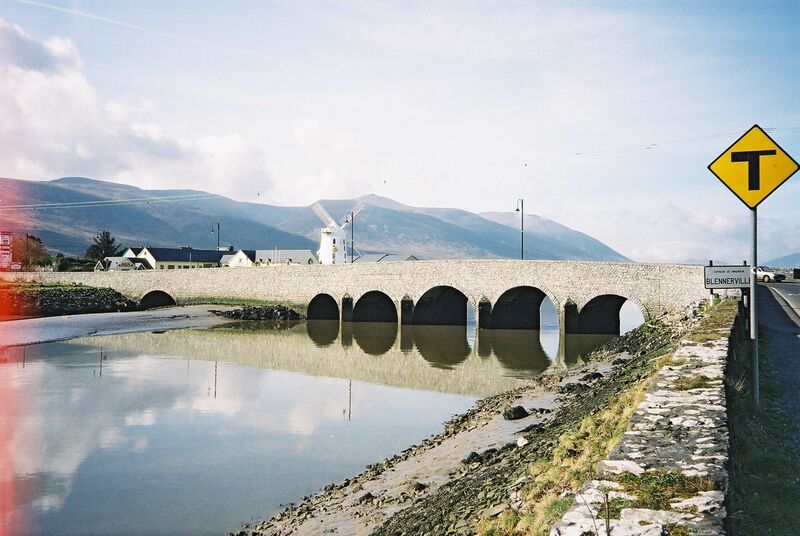 The approach to Blennerville from the Tralee side, showing Blennerville Bridge and, in the distance, Blennerville Windmill. 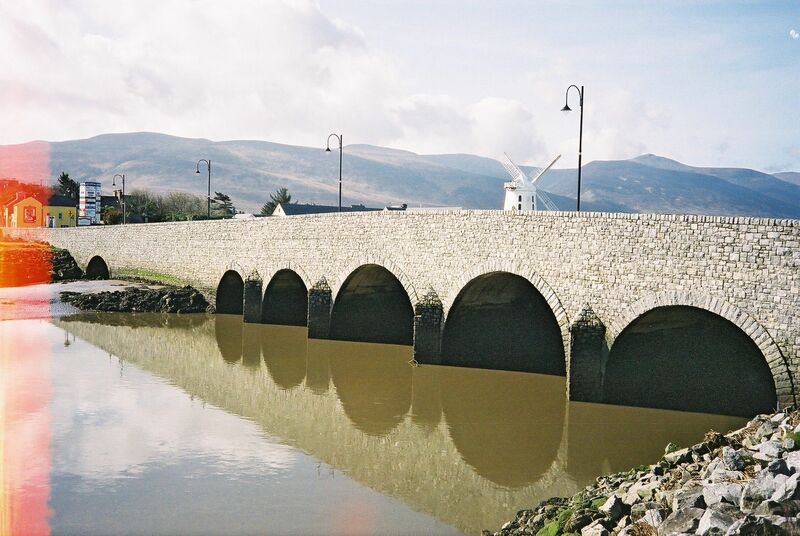 Blennerville Bridge. See full size. 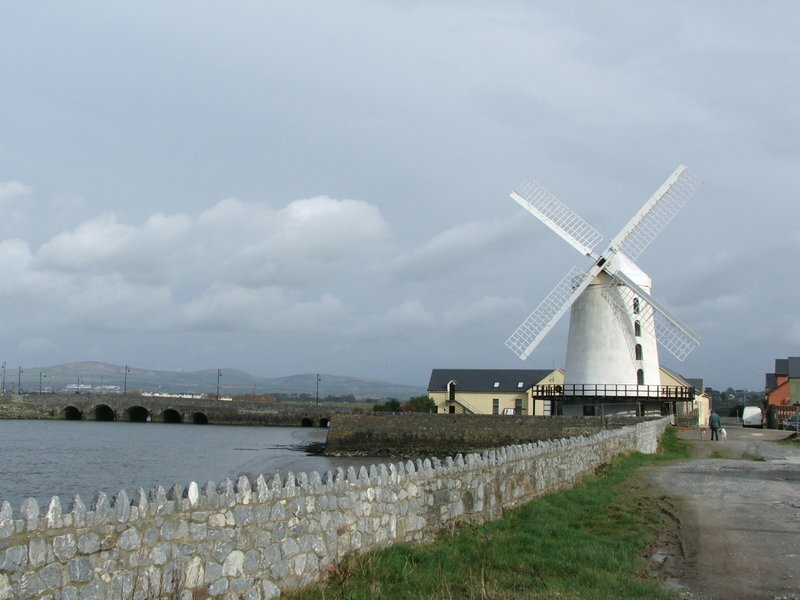 Blennerville Windmill was built by the founder of Blennerville Sir Rowland Blennerhassett, 1st Baronet in 1780 or 1800. Tralee Ship Canal opened 1846. Blennerville went into decline, the windmill fell into ruins. It had already fallen into ruins by the time of [Griffiths Valuation, 1853]. The ruins were then owned by the Chute family. It was restored later in 19th century. Windmill finally closed 1880s, fell into ruins again, in ruins by 1896. It was purchased 1981 by Tralee Urban District Council, and is now restored as a tourist attraction. The Blennerhassett genealogy on the wall at the entrance to the cafe is by Frank Blennerhassett, based on Bill Jehan's early work. 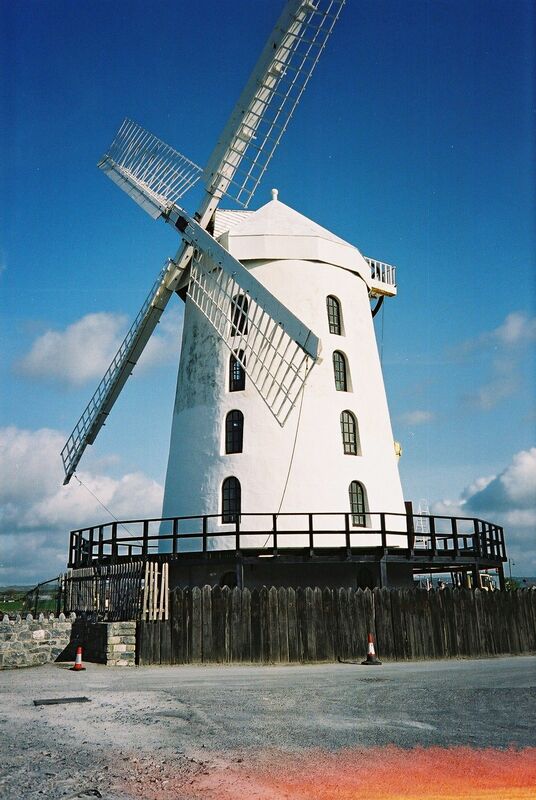 Blennerville Windmill. Photo 2003. See full size. 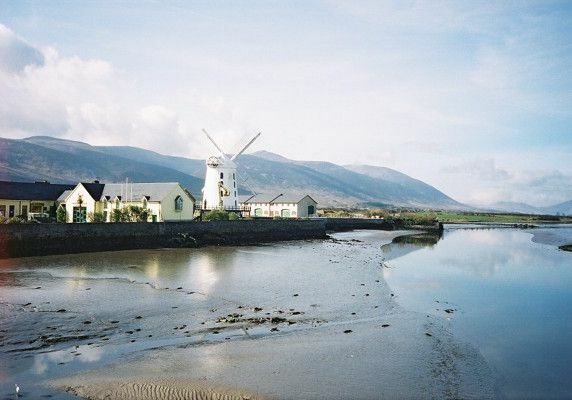 Blennerville Windmill, from the far side of the bridge, photo 2005. See re-use licence (also here). Blennerville Bridge in background on LHS. See full size. Blennerville Windmill 360 degree panorama. Click to rotate. From 360cities.net. Irish Emigration Research Project, Blennerville Shipyard (Blennerville Windmill visitor centre).